Carnival Beauty Care & Grooming are essential to FABULOSITY on the road and long term protection of your hair and skin. St.Lucia Carnival is exactly three weeks away, while Barbados Cropover and Toronto Caribana are weeks away also, have you made your appointments yet? The sun can dry out your hair making it dry, brittle and lackluster. So apply a leave in conditioner. It is vital for the maintenance of healthy hair that you do at least one (or all) of the following: either tie your hair up in a French twist or a bun when the sun is at its hottest, cover up using a hat or a bandana to provide added protection for your scalp, use styling products that have an SPF spray built into them, and/or have specific hair treatments designed to strengthen the hair. Wash your hair after Carnival Tuesday because of the accumulation of sweat, dust and excess oils. Manicured nails can accessorize your costume and make you look polished. So get creative with your finger nails and make a statement! When putting on your carnival tights remember to use gloves to prevent snagging. This video tutorial shows how to do Flower Glitz Nails. 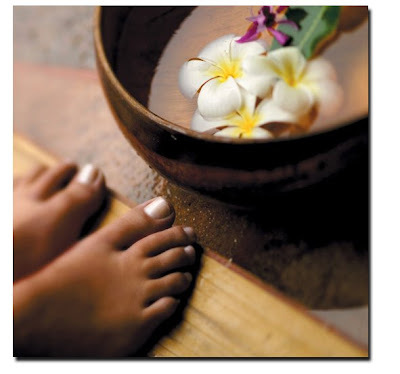 While pedicures are good, keep your pedicure simple. No toe nail extensions or long toe nails but do trim toe nails. Do not remove too much of the callus, hard skin under the feet. It should not be scrubbed or filed too low down because it works as a form of protection. Wear comfortable shoes to protect feet, especially the toes. Even wear two pairs of socks to cushion the toes and prevent blisters. After Carnival, soak your feet in warm water and epsom salts and then use aromatherapy oils and lotions (cucumber, mint) to soothe feet. Spas are like hair and nail salons, only better. In addition to hair and nail services, they offer relaxing muscle massages, pedicures, manicures, deep cleansing facials and even body scrubs, all in a comforting, soothing environment. Get a good facial to deep clean your pores, to remove black heads, acne and even hair and shaving bumps, and to leave your face smooth and hydrated. Body scrubs help to exfoliate dead skin and bring out fresh, younger looking skin. Body scrubs rid you of skin that is dry, scaly, and flaky, often the result of overexposure to the sun. It exfoliates dead skin, making the tanning process more uniform. Waxing is an effective method to remove large amounts of hair at one time. It is a long-lasting method. Hair in waxed areas will not grow back for two to eight weeks. Areas that are repeatedly waxed over long periods of time often exhibit regrowth that is softer and lighter in color and the amount of regrowing hair will be permanently reduced. Waxing of the legs and bikini line is also very popular around the Carnival season. Shaving causes razor rash, which is an infection of the hair follicles. If you get razor rash, it could get worse at Carnival time because you are more prone to sweat in the sun. Sweat could irritate the follicles and cause infection. Get a massage when carnival is over to relieve tension, stress, aches and pains. It soothes sore joints and muscles. Massages are great for your body and spirit; they can tone muscles and are ultra relaxing. The most important thing you should do before you dress is to put on sun block all over. Plaster it everywhere just like body lotion before putting on your costume. You should also put it on your ears, shoulders, face and areas of your scalp which are exposed and it should be re-applied every couple of hours, particularly on the face. Sun block should be at least SPF 30. If you leave your eyes naked, this puts pressure on your eyes because of glare, which can cause premature ageing of the skin around the eyes. Plus: Online appointment bookings and Vietnamese nail technician. Plus: The owner, Flora accepts walk-in appointments. No delays, Flora gets you in and out of her salon. Plus: Nestled on the Bois D'Orange hilltop, this spa offers relaxing & therapeutic spa treatments and hygiene comes first. these are excellent points for fabolosity during carnival!! somehow your blog is not loading properly for me. I see all the code for the blogger template then I have to scroll to see the new post.